Based on reviews from 20 experts and 1,040 users. 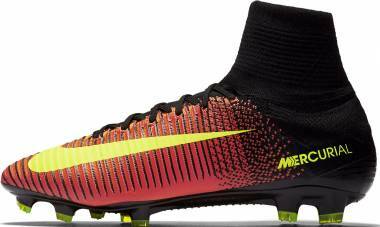 Learn how our rankings work or see our guide to Nike Mercurial football boots. Updated Apr 2019. Dubbed as Nike’s fastest football boots, the Mercurial collection is crafted with an array of explosive technologies fit for a modern-day soccer player. Elements of acceleration are thoroughly translated into innovations and has become the main focal point for manufacturing the boots under this category. It is a collection meant for speed in every angle of the boot. The cleats are engineered with lightweight materials to maximize agility while traction patterns are purposefully arranged for velocity. The Nike research team delved on a mission for four long years that eventually conceived the ground-breaking fabric originally designed for running. In 2012, Flyknit was finally released. The technology sprung from the runners' desire for a sock-like shoe. With that in mind, a layer of breathability, support, and flexibility were engineered. Flyknit is a micro-engineered fabric made of polyester yarn knitted to produce a seamless and form-fitting material. Its form is varied according to its purpose. For instance, it is more open and breathable as an upper material while it is more compressed and stable in areas that require support. 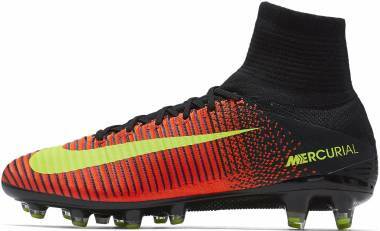 Two years after its advent, Flyknit has also become apparent in football boots headlining Magista and Mercurial football boots signature upper material. Its pliable and lightweight nature is especially beneficial for football dynamics. From then on, Flyknit has been developed even further to accommodate the current demands of athletes including soccer players. The evolution of this breakthrough has been notably utilized in several other shoes such as in running and basketball. Flyknit is designed to reduce the overall boot weight. Moving on the pitch with a light boot is a headstart for speed. Flyknit, as a woven fabric material is naturally light and has been proven to be generally two ounces lighter than other boots created with cut and sew method. This competitive boot quality enhances player acceleration in the pitch. Due to the Flyknit’s woven characteristic, it provides a more breathable layer. The three-knit weave aids in enhancing ball touch as less material is used. It is intended to produce a barefoot sensation while sustaining durability. The technology is built with an inspiration of having a boot that feels like second skin. Flyknit’s fabric sensation was constructed to offer a precise fit that hugs the foot snugly. Nike aims to decrease waste percentage significantly with the introduction of Flyknit in comparison to other footwears that were produced with a cut and sew method. It is is manufactured in an environment-friendly process, reducing the amount of material used for the upper. With this goal, they have started using recycled polyester to construct the yarn and ended up lessening their environmental waste by 60%. The best partner for speed is great ball control. With this in mind, the Nike research team came up with a brilliant innovation that significantly elevated the standards for ball touch. 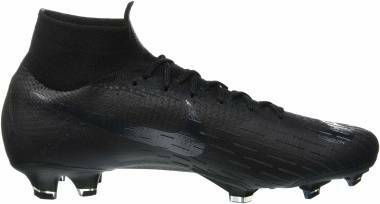 The 3D-textured Speed Ribs are the raised surface of the upper material positioned in the parts of the boot where the ball has usual contact. The friction produced between the ball and this embossed upper enhances the touch on the ball for better dribbling and shooting. The idea came out from an in-depth analysis of how players control the ball. Their propensity to dribble, switch and shoot the ball were intricately studied to work on the best possible upper texture. The Nike Mercurial football boots are customized with a plate meant to step the speed game up. The 3D Speed Plate is Nike’s soleplate technology engineered to naturally conform to shape of the foot. It is not the usual flat footbed as what its name suggests. It is contoured to follow the shape of the foot, including the arch, aiming for an exact one-to-one fit. The whole concept of cradling the foot was the very core of this innovation. It is physiologically tested to reduce pressure points. Consequently, it allows the foot to fit naturally to amplify the return of energy. The plate is 40% lighter than its previous carbon fiber version as the material used is reduced through a new vacuum process. Braking is an essential component of speed according to the Nike research team. With this, they have reinvented a stud configuration for the Nike Mercurial football boots intended for an optimized braking system. Among all other types of studs and stud combination, the Chevron studs were deemed to be the most effective in this aspect. The data was gathered after rigorous scientific testing known as FEA (Finite Element Analysis). Nike Grip is an internal boot feature that serves as an anti-slip element. With this technology, Nike aims to produce great traction inside and outside of the sock to distinctly prevent unwanted slippages and to ultimately, improve player traction. Created from ultrafine polyester fibers, the innovation takes on grip to a new and unique level by increasing the friction of the foot to the shoe with the presence of the nanofibers. The Vapor XI FG is one of the Nike Mercurial football boots with this feature. ACC (All Conditions Control) Technology is the treatment done with the upper material of Nike shoes including the Nike Mercurial football boots. The purpose of this innovation is to protect the boot in all weather conditions, whether it’s wet or dry. It maintains the surface friction and consequently, enhances ball touch regardless of the weather. Some of the Nike Mercurial football boots featuring this technology are Superfly V FG and Vapor XI FG. Some Nike Mercurial football boots feature the Micro-textured synthetic as the upper material. It is a lightweight microfiber material that anatomically conforms to the shape of the foot. 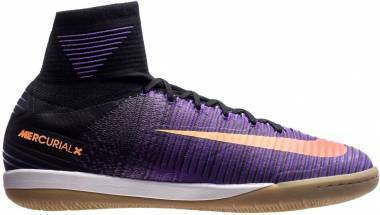 The Nike Mercurial football boots that belong to the Veloce and Victory collection have micro-textured synthetic as the upper material. The technology is a layer of hybrid mesh and polyurethane film. The combination of the flexible mesh and supportive PU material creates a protective yet barefoot sensation when touching the ball. The upper innovation is designed to work well with ACC technology. The MercurialX Finale is one of the few Nike Mercurial football boots embedded with this material. 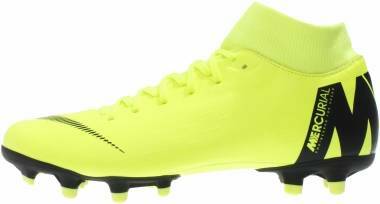 These soccer cleats are designed in Blue, Silver and Volt color combination likened to the first Nike Mercurial football Boot but is fashioned in a differently striking way. The boot design elements are reminiscent of Neymar’s personal and career life. Designed with the Brazil Flag and the constellations symbolic of his six favorite goals. The boot is fashioned with a unique color scheme which includes University Red, Black and Bright Crimson. The bold colors represent Neymar’s fiery passion for the sport. The main colors of the boot are:Obsidian,White-Gamma,Blue Glacier and Blue-Gamma. The calm hues express Ronaldo’s accuracy and calmness in playing. It is derived from the expression “Ice in your veins” which means the ability to remain calm and controlled in a situation. The boots signify Ronaldo’s unbeatable successes in his professional life. “Melhor” means “best” in his native Portuguese language. 1998 - The very first Nike Mercurial football boot was launched in 1998. Inspired by Ronaldo’s mastery in the pitch, Nike crafted a boot that suited his striker skills. The silo was engineered with an inspiration for speed, a signature skill in Ronaldo’s playing style. The boot was made of KNG-100 synthetic upper, a much lighter and thinner material than leather. It was debuted in striking blue and yellow colors to highlight Ronaldo’s feet. 2000 - The Nike Mercurial football boot successor was released in 2000. Known for its lightweight quality, the Nike Match Mercurial weighs 230 grams. It was launched together with other boots in the Alpha Project. 2002 - Two years after, the pursuit of speed in the Nike Mercurial football boots was put to a whole different level with the release of the very first Mercurial Vapor. With this boot, comfort was the new core element to match with acceleration. 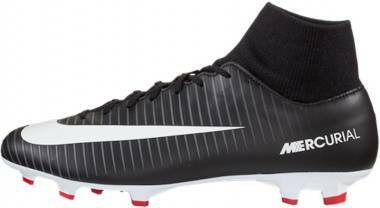 2004 - The second version of Mercurial Vapor was released in 2004. Updates to the boot include a larger heel tab to serve as a cushion for the ankles. 2006 to 2008 - Different versions of the Mercurial Vapor boot were released including its third and fourth versions. Teijin microfiber was introduced as the new upper material and was later redesigned to cover the laces for wider strike zones. 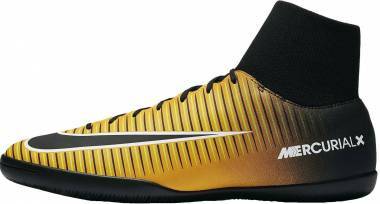 2009 - Nike Flywire debuted with the release of better-than-ever Mercurial boot known as Mercurial Vapor Superfly. Succeeding versions of the boot continued until the present. The introduction of Flyknit and Dynamic Fit collar became two of the highlights for the boot’s evolution. 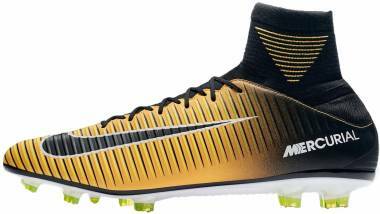 Why are the Nike Mercurial football boots worth investing in? The Nike Mercurial football boot collection is one of the long-standing line-ups in Nike history. The significant improvements in the collections’ evolution are a proof of the boots’ superior yet dynamic quality. It evidently shows how much Nike is ready to invest when it comes to the success of their boots, even if it would take years of study to come up with an breakthrough technology. The transition from a KNG-100 synthetic upper to a full Flyknit construction is symbolic of the boot’s never-ending goal for speed. These materials are engineered to be the lightest and most comfortable for the foot. If you are player who put more focus on acceleration on the pitch, then this is one boot worth investing in. If a boot can help save the environment, then is certainly worth investing in. Nike’s Flyknit composition is built to lessen environmental waste due to the reduction of materials in its manufacturing process. 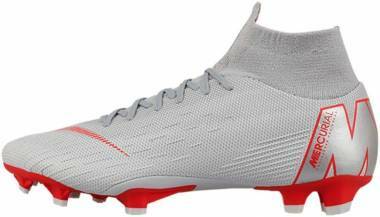 Boots from popular Nike collections are known for their hefty price tag, and the Nike Mercurial football boots are no exception. 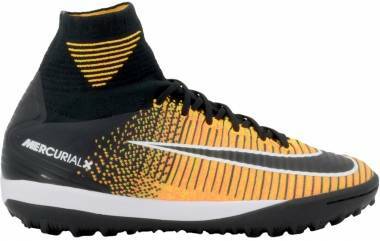 However, the pricing range is not limited to the high-end Mercurial shoes. There are boots within the collection that are affordable. 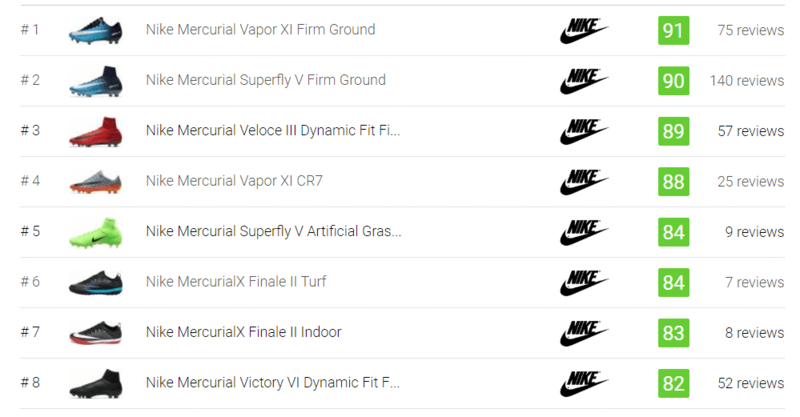 For the Mercurial Firm Ground, Indoor and Turf boots, the lowest-priced boots are at $85-$95. What is the difference between the Nike Hypervenom and Nike Mercurial boots? The Nike Mercurial Football boots are engineered for speed while the Hypervenom boots are created with a vision for traction and power in the pitch. The table below shows the differences between the two boot collections according to features. It is only applicable to most but not all of the boots within the collection. 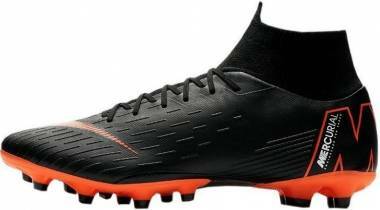 Is the Nike Mercurial football boots the best choice for me? Mercurial boots are ultimately designed for speed-oriented players. Its lightweight characteristic brought dominantly by its Flyknit upper is meant to build more player confidence while sprinting and controlling the ball. If you are the type of player who wants to go for a head start in shooting the ball by outrunning the defenders, then this boot built for acceleration will work best for you. Which boot is lighter, the Nike Mercurial Football boot or Nike Hypervenom Football boot? In general, the Mercurial cleats are much lighter than the Hypervenom boots. 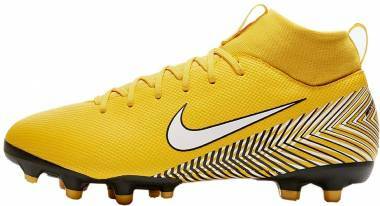 The Nike Mercurial football boots weigh approximately 6.09 ounces while the Hypervenom boots are at 7.02 ounces. However, based on players feedback, the weight difference is not as noticeable when playing.